Home is where the heart is and for Emily Meyer, her home and heart remain firmly rooted in Huntington, Indiana. She was born there and with the exception of one year living in Baton Rouge, Louisiana, she has lived in Huntington all her life. She makes her home there with her husband and two children, son Austin and daughter, Rachel. Up until a three years ago, Emily kept herself on the go and very busy managing her kids and working full time as a welder. "Most people can't believe that I am a welder," she remarked, adding, "I actually love to work with my hands and believe it or not, people don't seem to realize that welding requires a bit of artistic talent." But an injury side-lined her and she ended up confined to the house. "My life is usually so fast paced, so sitting on the couch with nothing to do was more than I could stand." Looking for anything to keep her mind busy, she discovered needle felting. 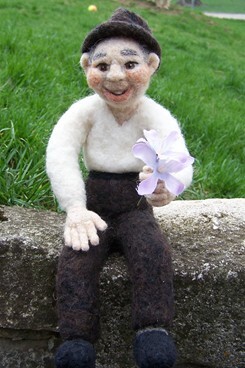 At first, she was attracted to the appearance of the needle felted creations. "Some of them were whimsical and some were quite realistic." She continued, "It was hard for me to understand how someone could take raw wool and sculpt it into something so beautiful. She purchased a kit, mainly out of curiosity, but after creating her first works, she was hooked. "I returned to work after my injury had healed and would find that after a long day, found felting to be very relaxing." It proved to be a productive outlet for her creative energy that she felt had been missing for quite some time. Emily's first felted creations were made for family and friends. Then she started selling locally by word of mouth. "It's just been within the last year that I've started selling my sculptures through online auctions." Now that her children are older, she finds she has more time to create. Felting all sorts of creatures, from fairies to bears, Emily likes to work on a variety of animals and people, coming up with new designs to keep the art exciting. "I needle felt for the love of it,"Emily confessed . Still, she finds she is limited to the amount of felted pieces that she can produce, due to the fact that she works full time. But she always finds time to do the things that she loves; fishing with her family, gardening and of course, creating new critters with her needles and wool.